A regular breeding resident and migrant; the Veery was an abundant species during the Minnesota Breeding Bird Atlas (MNBBA). The Veery is widely distributed in North America in the upper midwestern and northeastern United States and Canada, south throughout the Appalachian Mountains to northern Georgia and west to British Columbia and Washington State. Its distribution is patchy throughout the Great Plains of the central United States and Canada. Highest densities occur in northern and north-central Minnesota, eastern Ontario, and western Quebec (Figure 1). Assigned a Continental Concern score of 12/20 by Partners in Flight; designated a Species in Greatest Conservation Need by the Minnesota Department of Natural Resources and a Stewardship Species in Minnesota by Audubon Minnesota. Long-distance Neotropical migrant that winters primarily in south-central and southeastern Brazil. Arthropods and fruit primarily secured from the ground. Open-cup nest on the ground or slightly elevated in the base of a bush or small tree. Breeding distribution and relative abundance of the Veery in North America based on the federal Breeding Bird Survey from 2011 to 2015 (Sauer et al. 2017). Roberts (1932) described the distribution of the Willow Thrush, as the Veery was known then, as “throughout the wooded areas of the state, increasing in abundance northward.” He emphasized that conditions were generally unsuitable in the southwestern part of the state in the late 19th and early 20th centuries, but that the species was common in selected locations, such as along the Minnesota River and at Lake Benton. Although two nests were found, the Veery was uncommon in wooded valleys of the Des Moines River in Jackson County. Also by the early 20th century, the species was no longer common south of the tamarack and spruce swamps of Isanti and Pine Counties. Roberts (1932) reported confirmed nesting (nest and eggs) from Cass, Crow Wing, Hennepin, Isanti, Itasca, Mille Lacs (with a picture), Otter Tail, Sherburne, and Steele (also with a cuckoo egg) Counties as well as at Itasca State Park and Minneapolis. He reported inferred nesting in Becker County (nest only) and noted that 2 nests were found by John Knox in Jackson County in 1902, but he did not include this observation in his Minnesota nesting section. Perhaps it was unconfirmed, too likely hearsay, or just forgotten. In his 1936 revision, Roberts noted 2 more nests but both in areas with previous records: Itasca County and Itasca State Park. Green and Janssen (1975) also present the Veery as a resident throughout the state but write that it is “very scarce and local south and west of a line between Washington, Stearns, and Otter Tail Counties. They emphasized that its status in southwestern Minnesota was poorly known. They did not present a summary of counties with confirmed nesting records, and they added that in the southeastern region the Veery has never been very numerous and is restricted to a few areas, like Nerstrand Woods (Rice County), Forestville Woods (Fillmore County), and the Whitewater area of Wabasha and Winona Counties. Janssen (1987) presented the Veery’s distribution as well represented in the northern half of the state and in the groves on the prairies of the northwest region south to Otter Tail County. Its southern distribution extended to Anoka, Ramsey, and Washington Counties, but it was also sparingly breeding in riparian tributaries and heavy woods in the southeastern region. Further, he stated that the Veery is not known to breed in the southwest, though there are breeding observations from Lyon County. He identified confirmed nesting since 1970 in 10 counties including Cass, Clearwater, Cook, Hubbard, Lake, Marshall, Mille Lacs, Morrison, Polk, and St. Louis. Hertzel and Janssen (1998) added another 6 counties to the confirmed list since 1970: Anoka, Becker, Dakota, Red Lake, and Scott Counties, plus a nesting record from the southeastern region in Winona County. The Minnesota Biological Survey (MBS) provided substantially greater detail, recording 2,277 breeding season locations throughout the state. The MBS confirmed the extensive distribution in the northern portion of the state, especially in the Laurentian Mixed Forest and Tallgrass Aspen Parklands Provinces, and in the northern regions of the Eastern Broadleaf Forest Province. Locations were also scattered throughout the fringes of the southwest, including along the southern edges of the Minnesota River and into the southeastern counties of Fillmore, Houston, and Mower; 1 location was in Watonwan County. MNBBA data exhibited a similar pattern. It included 4,318 records that ranged south to Murray and Steele Counties and to where the species was previously recorded in Lyon, Mower, and Watonwan Counties (Figure 2). Breeding records were included for 42.2% (2,004 of 4,754) of surveyed blocks and 50.6% (1,182 of 2,338) of priority blocks (Figure 3; Table 1). The extensive breeding presence throughout the northern regions was documented, especially in Beltrami, Koochiching, Lake of the Woods, Marshall, and Roseau Counties. Nesting was confirmed in 72 blocks, including new county records for Aitkin, Beltrami, Carlton, Kanabec, Kittson, Koochiching, Mahnomen, Pine, Rice, Roseau, Todd, Washington, and Wright Counties. The prediction map for the Veery in Minnesota, suggests substantial densities throughout much of northeastern, northern, and north-central Minnesota ranging from 1-10 pairs per 40 ha (Figure 4). Much lower densities ranging from 0.1 to 1 pair per 40 ha were predicted for more southerly and western regions of the state. Higher densites were predicted for a few scattered areas of young regenerating aspen in the Iron Mining areas in northeastern Minnesota and in the Tallgrass Aspen Parklands Province. The Veery is still a very common to abundant species throughout a substantial part of Minnesota. The species’ range described by Roberts in 1932 has undoubtedly been reduced by conversion of forests and riparian woodlands to agricultural and urban uses since the mid-1800s. The breeding range, however, is larger than that reported by Janssen in 1987. Some of the expanded range is due to more extensive coverage by the MBS and the MNBBA and not necessarily to any recent range expansion. The distribution in Minnesota is similar to that found in Wisconsin, where higher populations were observed in the northern portion of the state (Cutright et al. 2006). However, confirmed nesting in Wisconsin extended much farther south, to most of the southern tier of counties. In the review of the Veery in North America, Bevier et al. (2005) did not mention any major changes in the breeding distribution of the species in North America. Breeding distribution of the Veery in Minnesota based on the Breeding Bird Atlas (2009 – 2013). Summary statistics of observations by breeding status category for the Veery in Minnesota based on all blocks (each 5 km x 5 km) surveyed during the Breeding Bird Atlas (2009-2013). Summary statistics for the Veery observations by breeding status category for all blocks and priority blocks (each 5 km x 5 km) surveyed during the Minnesota Breeding Bird Atlas (2009-2013). Predicted breeding distribution (pairs per 40 hectares) of the Veery in Minnesota based on habitat, landscape context, and climate data gathered during the Minnesota Breeding Bird Atlas (2009-2013) using the General Linear Modeling method with an adjustment for detectability. Roberts (1932) described the Veery as breeding in areas of “low, damp woodlands, preferring especially tamarack swamps, and thickets of poplar, willow, and alder, bordering streams and lakes.” The Veery has also been described broadly as using damp, deciduous forests and as having a preference for riparian habitats and forests with dense understories (e.g., Kendeigh 1948; Beals 1960) (Figure 5). The Veery was detected in a variety of habitat types surveyed during the MNBBA including shrub wetlands and several forest cover types, such as northern mixed, lowland coniferous, pine, northern hardwoods, upland coniferous, and pine-oak barrens (Figure 6). Most of these habitat types are associated with dense understories. Habitat analyses by the National Forest Bird (NFB) Monitoring Program found significantly higher use of lowland hardwood forests and regenerating forests, but the species was also commonly found in aspen-birch, lowland shrub, and oak cover types (Niemi et al. 2016). Typical breeding habitat of the Veery (© Gerald J. Niemi). Habitat profile for the Veery based on habitats within 200 m of point counts where the species was present during the Minnesota Breeding Bird Atlas (2009-2013). Partners in Flight estimated a United States and Canadian breeding population of 12 million adults and a Minnesota population of 880,000 (Partners in Flight 2017). MNBBA estimated a breeding population of 1.96 million adults (95% confidence interval was 1.82 – 2.24 million). Pfannmuller (2012) suggested that approximately 6% of the Veery global breeding population occurred in Minnesota. This is supported by the BBS map, which indicated that high densities of the species occur in Minnesota (Figure 1). Despite the lower estimate of Minnesota population by Partners in Flight (2017), their recent estimate suggests that 8.3% of the breeding population exists in Minnesota. 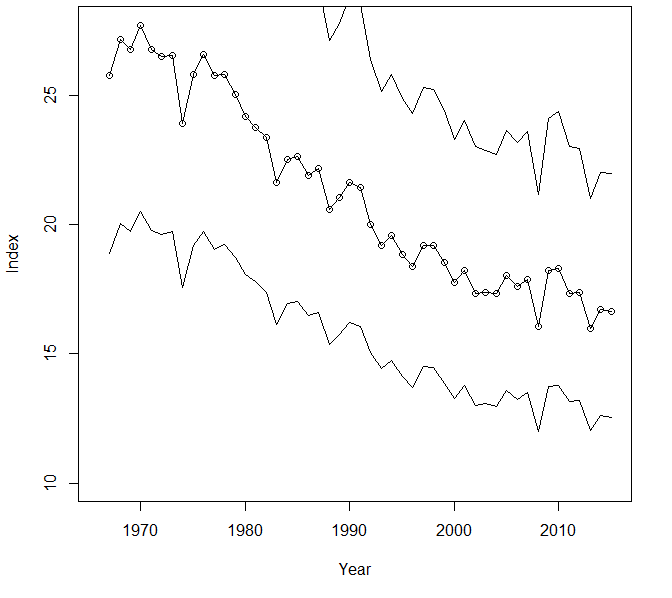 The federal Breeding Bird Survey (BBS) indicated a significantly declining population trend in Minnesota of 0.9% per year from 1967 to 2015 (Figure 7). This is consistent with trends across a broad region including Michigan, Ontario, and Wisconsin as well as throughout Canada and the United States. Partners in Flight estimated an overall global decline in the population of 40% from 1970 to 2014 (Partners in Flight 2017). In North America, the population decline of the Veery is widespread and severe across the continent (Figure 8). There are only a few patches where the species appears to be increasing such as in northern Indiana and Ohio, in West Virginia, and in several small areas in the northern portions of its breeding range. The NFB Monitoring Program found conflicting trends from 1995 to 2016. The Veery is significantly increasing by 1.4% per year in the Chippewa National Forest but has a nonsignificant declining population of 0.6% per year in the Superior National Forest (Figure 9). Overall mean density estimates in the Chippewa and Superior National Forests were 4.4 and 3.5 pairs per 40 ha, respectively (Niemi et al. 2016). These findings are consistent with the greater population density in north-central compared with northeastern Minnesota. Mean population densities in the habitats where the species most frequently occurs include 2.1 and 9.3 pairs per 40 ha in regenerating forests of the Superior and Chippewa National Forests, respectively; and 6.6 and 8.3 pairs per 40 ha in pole-sized, aspen-birch forests of the Superior and Chippewa National Forests, respectively. Slightly lower densities were found in lowland shrub and lowland hardwood forests. Breeding population trend for the Veery in Minnesota for 1967–2015 based on the federal Breeding Bird Survey (Sauer et al 2017). Breeding population trend map for the Veery in North America for 1966–2015 based on the federal Breeding Bird Survey (Sauer et al 2017). 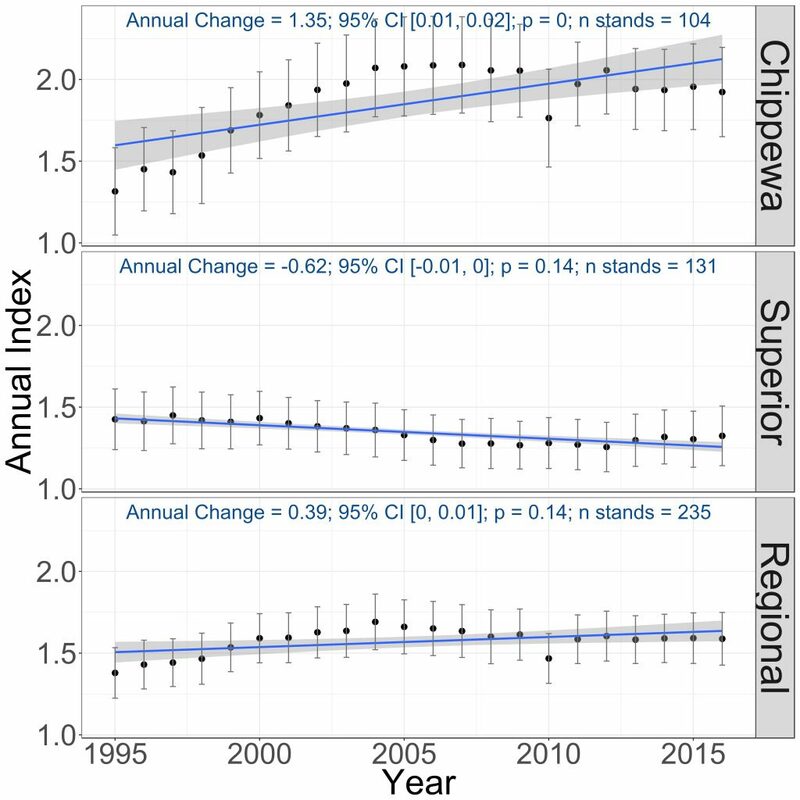 Breeding population trends of the Veery in the Chippewa and Superior National Forests and the combined regional trend, 1995–2016 (Bednar et al. 2016). Partners in Flight gave the Veery a moderate Conservation Concern Score of 12/20, primarily because of its long-term decline and threats to the species (Rosenberg et al. 2016). Remsen (2001) found that the Veery appears to occupy a relatively small area on its wintering grounds in Brazil, and hence it is vulnerable to future changes within that area. Bevier et al. (2005) emphasized that the region in Brazil was undergoing rapid destruction of forested habitat for agriculture. The Veery is also listed as a Species in Greatest Conservation Need by the Minnesota Department of Natural Resources (2015). The primary reasons for the listing were its long-term population decline and that Minnesota represents a significant portion of the species’ breeding population, which is the highest of any U.S. state. For similar reasons, Audubon Minnesota identified it as a Minnesota Stewardship Species (Pfannmuller 2012). Several additional factors have been mentioned as potentially contributing to the species’ decline besides concerns about its wintering grounds. Robbins et al. (1989) and Blake (1991) both identified the Veery as area sensitive to forest fragmentation on the basis of its limited use of small forest fragments. The Veery may have lower reproductive success in smaller forest fragments due to increased predation of nests and increased nest parasitism by Brown-headed Cowbirds. Langham et al. (2015) and the National Audubon Society (2015) identified the Veery as “climate threatened” because of a predicted loss of 89% of its current summer breeding range by 2080. If the species is forced to move farther northward to find suitable habitat, then it would have a much longer migration route and be susceptible to more hazards migrating to and from southern Brazil. Beals, Edward. 1960. “Forest Bird Communities in the Apostle Islands of Wisconsin.” Wilson Bulletin 72: 156–181. Blake, John G. 1991. “Nested Subsets and the Distribution of Birds on Isolated Woodlots.” Conservation Biology 5: 58–66. Kendeigh, S. Charles. 1948. “Bird Populations and Biotic Communities in Northern Lower Michigan.” Ecology 29: 101–114. Remsen, J. Van, Jr. 2001. “True Winter Range of the Veery (Catharus fuscescens): Lessons for Determining Winter Ranges of Species that Winter in the Tropics.” Auk 118: 838–848.